So today I'm sharing something with you all which is personal to me. Something which was created for me by the most wonderful people. 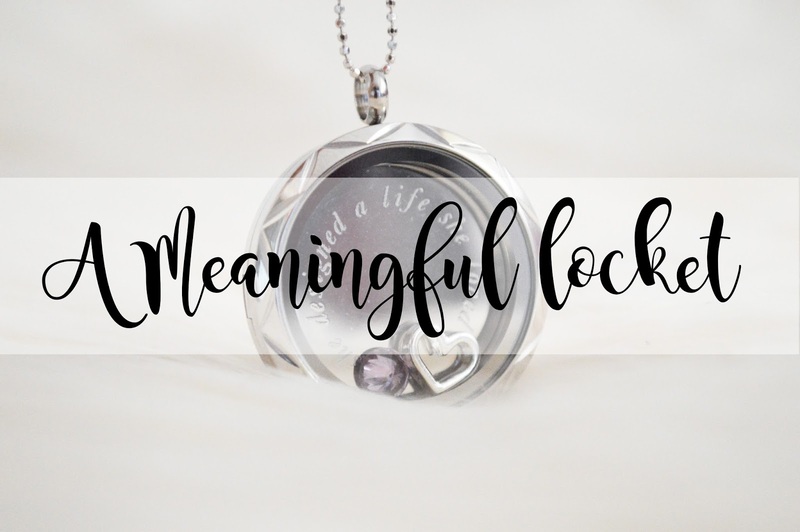 If you haven't heard of Lavish Lockets then you need to head on over to their website now and take a look at how incredible they are. "Lavish Lockets by Lavish & Co. are the UK's Original Floating Locket company. Following their launch in 2013 they have paved the way in affordable luxury jewellery. Lavish Lockets have won awards for their products and service and you can be rest assured you are buying the best! They believe a piece of jewellery is even more special when the wearer has a personal connection to it. Be it memories, hopes, dreams, family or their most favourite things". I completely fell in love with Lavish Lockets because of how personal each and every item is which they sell. I was scrolling through their Instagram account and saw some of the most beautiful lockets ever which they have created for their customers, whether it's something which provides their customer with a memory of something or someone or even a physical item which shares their dreams with everyone who sees it. There are so many different lockets to choose from and not only are there a crazy amount of lockets but there are a wide range of chains to pick from as well; being indecisive, this part took forever! Lavish Lockets have charms available for everything you can imagine, from animals, to charities, to love and remembrance. There are a wide selection of beautifully handmade charms for each category; they are truly stunning. 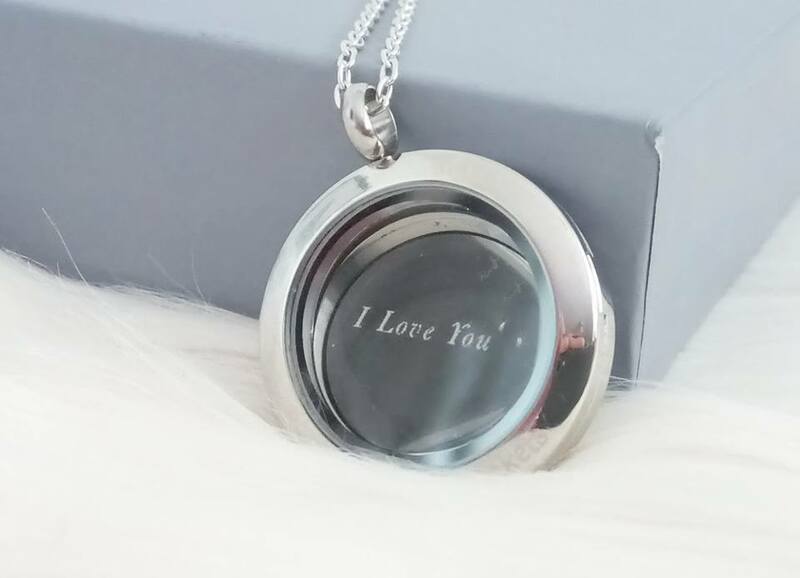 I knew exactly what I wanted when I saw their range of charms and I knew even more when I found out you can have your own personalised back plate in the locket too. I've been with Luke for two years now and I've always wanted something which was personal for the both of us and our relationship. I completely fell in love with the diamante medium locket (I loved the heart one too, but you can't have a back plate with the heart locket). In the back plate I chose to have our anniversary date and "Always and Forever" engraved into the front side of the plate with "I Love You" engraved into the back"; Luke absolutely loved this and they Lavish Lockets couldn't have made it more perfect! I chose four charms in total to go inside this locket, however so you can clearly see the engraving I'm only showing you one here! But I decided to go for a heart which is engraved with forever, a diamante "L" and "K" for our initials, as well as an infinity sign! I have to say, I do prefer the locket with all of the charms in and I wear it every single day. 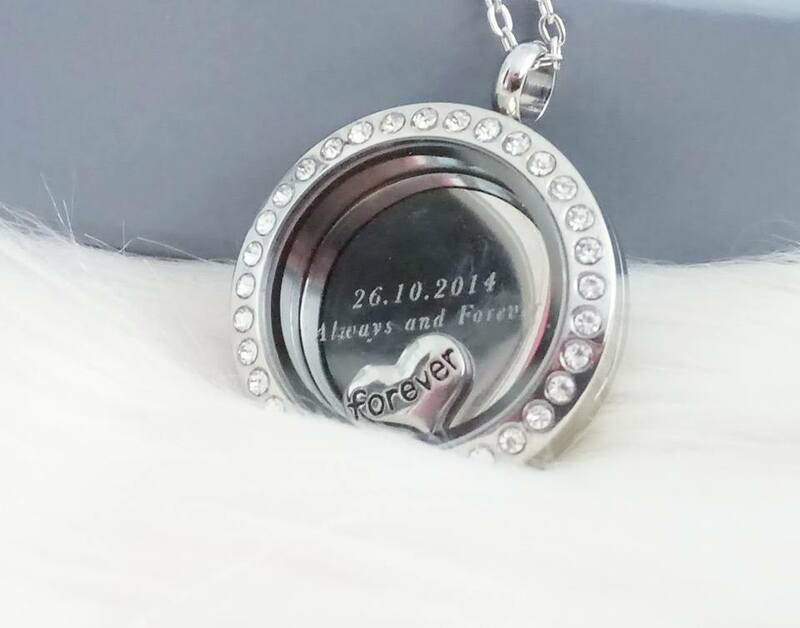 I've seen so many personalised necklace's out there for relationships or families but this one tops all of them. To be able to have a locket (my favourite type of necklace), with engraving and charms too, you just can't go wrong! These lockets are truly affordable too. I also wanted a necklace which represents who I am and the two quotes I live by. I have these quotes written down, printed out and even on every single one of my social media accounts but that wasn't enough, I needed them more personal to me. I decided to go for the large locket instead this time and more of a simple design too. 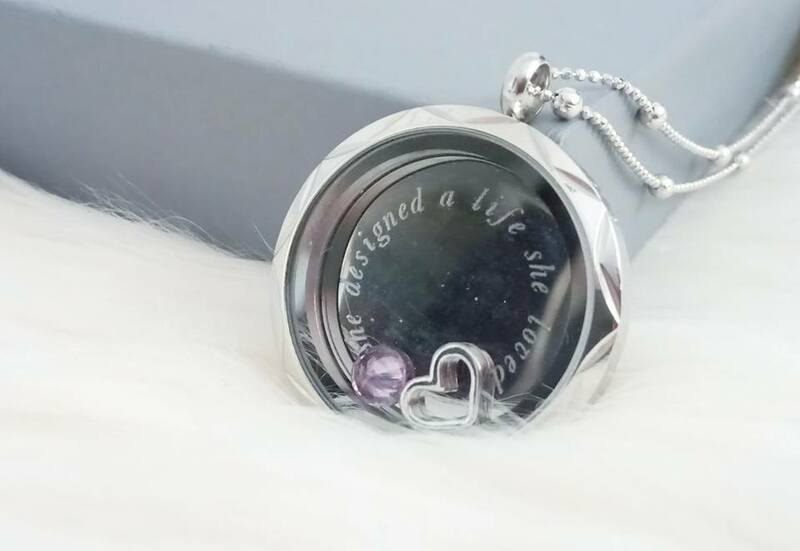 I also chose two charms to go inside this locket which include the simple silver heart and my birthstone which personalises the necklace that little bit more. I would have probably chosen more charms however I didn't want to hide the words which I had chosen. One quote I used to live by as a teenager was "Everything happens for a reason" because whenever something went wrong, which was fairly often; I always believed it happened for a reason and I still do but two beautiful quotes have taken over from this as my life has changed. Firstly, "She designed a life she loved" represents my life as a whole. Within the past couple of years I've started to make a few changes to my life and how I see it. I've chosen to have my life the way I want it, not the way other people want me to have it. I've designed my life the way I want it so I'm in love with what I do and I'll always continue to do this. 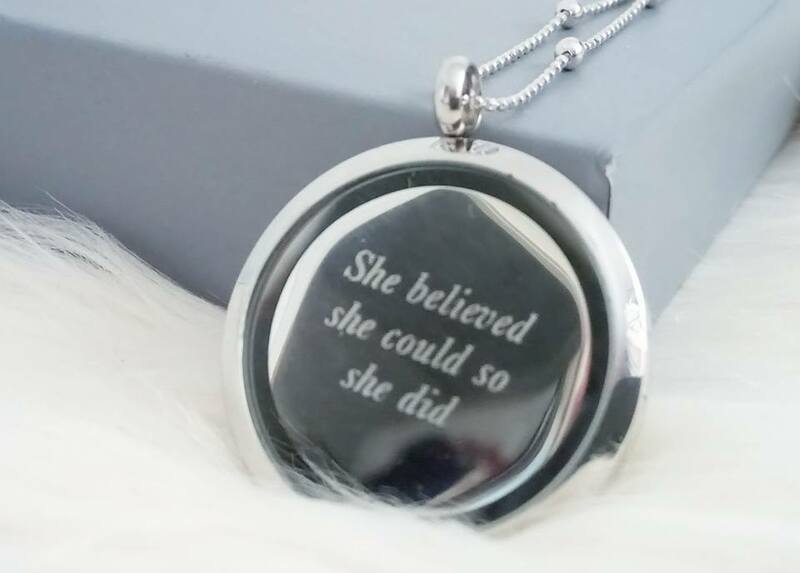 I also chose "She believed she could so she did", another quote which I truly believe represents me. I've always thought I could do something but never gone through with it because of lack of confidence but after being bullied I do anything I believe I can, because I always knew I could, but no one else did. Lavish Lockets have kindly given me a cheeky gift code of £20 for one of you lucky ladies or gentlemen to win, so you can create your own beautifully hand created locket which is personal to you in one way or another! Good luck to everyone who enters! This post feature product(s) which I was sent for review purposes however all opinions and thoughts are my own. Since finding Lavish Lockets, I have fallen in love! I love their idea regarding the little charms in a locket. I've never seen anything like it! I especially love that you can engrave it aswell, makes it even more personal. I would love to do something similar with your partner one, I've been with my partner for four years now, so I would love something to symbolise that. Also having the chance to add more charms to it, is perfect! Whoever wins this is one lucky individual!